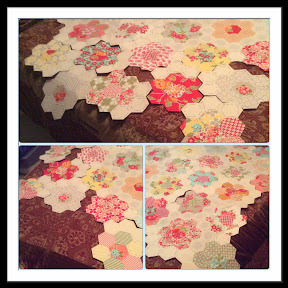 In 2015, I am going to focus on finishing my projects and top on my list is my Grandmother's Flower Garden. I made a lot of progress in 2014 - thanks to all of my EPP friends and the encouragement sent my way. The quilt currently measures about 45" x 55" and it is for a queen bed, so I still have some stitching to do! I am really looking forward to 2015 and linking up with Jessica at Life Under Quilts! Great progress! I'm with you on finishing the quilt in 2015. This is going to be so lovely....what am I saying, it's lovely already! That is going to be such a pretty quilt. Lovely fabric choice. Nice progress! Love your fabric! These are projects we can't rush, however having a goal is good too! I love the colours, this is going to look gorgeous on your bed. This is so pretty! Love the fabric.